Back in the days when America was a prosperous country, eating conformed to Thorstein Veblen’s doctrine of conspicuous consumption. Oenophiles and varying kind of agrophiles and phobeds flocked to restaurants that specialized in presentation. There was a particular fascination with all things French, duplicating a fixation that began in Russia with Peter the Great, and that ran right up until the revolution. (The elegant Manhattan gallery, A La Vieille Russie, specializes in Faberge eggs and the kinds of Russian Imperial treasures that canonize French culture.) The appearance of French food was once seen as a form of ostentation similar to the luxury goods—cars, summer homes, jewelry—so often used as expressions of class superiority. Escoffier and Emily Post are personifications of class consciousness, in that the manners, mores and appreciation they exude require a certain level of leisure time, while simple dishes like meat loaf and potatoes are associated with the working man or woman, for whom eating is a matter of refilling the empty tank, an act generally accomplished with a silent, often sullen counterpart in front of the TV. Writers like Julia Childs and M.F.K. Fisher taught us about haute cuisine, but what about moyenne cuisine or basse cusine, like the Croque Monsieur sold in most French cafes? Today, with tempers short and pocketbooks thin, the age of haute cuisine has happily passed. Those Goldman Sachs executives who can afford to eat in the grand old French restaurants don’t dare to be photographed using their stimulus bonuses to purchase overpriced meals. La Grenouille is one of the last on a list that included La Côte Basque, which figures in the title of Truman Capote’s famed expose of café society that served to exile him from the very world into which he’d longed to gain entrée. 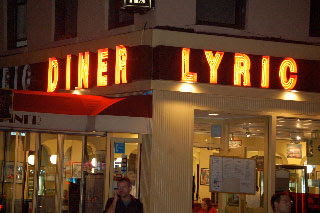 This is the age of comfort food, with 24-hour diners in their original Greek form (the Athens, the Dionysius, the Parthenon, the Ethos, the Lyric) or in ersatz incarnations such as the Brooklyn Diner or Big Daddy’s, which raise prices by treating a viable part of American cuisine as a period piece. “The reports of my death are greatly exaggerated,” Mark Twain said. Similarly, murmurings about the demise of the local diner are premature. After all, what can be gotten at La Grenouille that can’t be gotten at the Lyric? Here is a comparision: at La Grenouille, the service is formal, the food excellent (if you like quenelles), and the atmosphere elegant. At the Lyric, the service is surly, the food is good (if you like Chicken à la King), and the atmosphere is comforting—if you are at the point where you have lost everything (or know someone who has), and have nowhere else to go. The lighting can be harsh, but so is life. Viva la Lyric. I've loved it for years -- but you're right about the lighting. Ouch! 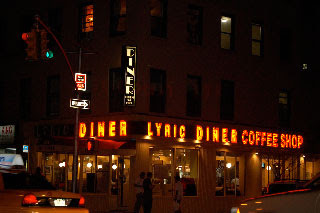 I'm actually a great friend of the Gramercy Diner, but the Lyric is really defiant. 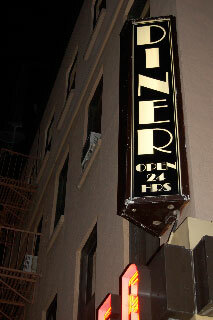 H and I actually celebrated New Year's there once. Thanks Susi.